The Children's Center offers a two-week Summer Camp. Students who have been attending Children's Center during the current school year are eligible for enrollment. You may enroll your child in one or both weeks of the Summer Program. Sessions run Monday–Friday from 9:00AM–12:00noon. Early Care is offered from 8:00AM and lunch is offered until 1:00PM for an additional charge. Each day is filled with arts & crafts, fun hands-on experiences, and outdoor play. The themed weeks often include very special snacks and feature special guest entertainment. Classes are grouped by age. Registration is going on now and is on a first-come-first-served basis. 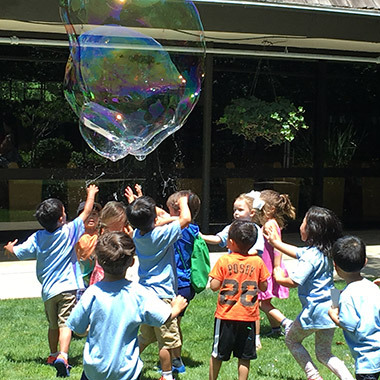 At Summer Fun Camp 2019, we will celebrate all things outside! Children will explore Planets, Ocean Life, Bugs & Insects, and Camping.